The new generation Petzl Ange L carabiner represents the middle ground between the traditional gate carabiner and the classic wire gate carabiner. It combines the fluidity of the spring gate with the lightness of the wire gate system. Petzl's MonoFil Keylock technology and the H-profile make the Ange L carabiner weigh a light 34 grams and provide an optimal weight-to-strength ratio. So it is particularly suited to users looking to reduce weight while keeping the functionality of a standard size carabiner. The shape of the nose is designed to optimize clipping and unclipping. Petzl's MonoFil Keylock ensures smoother opening and closing of the carabiner and a much longer lifetime compared to traditional wire gate carabiners. The unique H-profile allows an optimal size and strength-to-weight ratio. 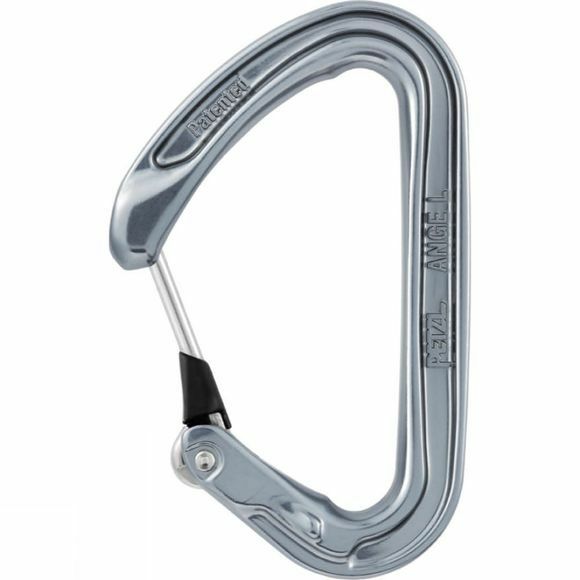 The indent on the bottom of the Ange S and Ange L carabiners helps keep the string in place so that the sling is properly positioned on the carabiner.